Trieste Boca Raton is a newer guard-gated community of luxuriously crafted townhomes that is situated in an ideal east Boca Raton location. Developed by Toll Brothers, one of South Florida's top luxury builders, Trieste townhomes boast elegant Mediterranean-inspired architecture, exquisite designer details, and exceptional quality craftsmanship. With award-winning landscaping throughout the community as well as many desirable on-site amenities, Trieste Boca Raton is the perfect place to enjoy the laid-back South Florida lifestyle. Nestled on over 12 tropically-landscaped acres, Trieste Boca Raton is complete with 109 luxurious, three-story townhomes, offering three unique floor plans from which to choose. Trieste townhomes range in size from 2,850 to over 3,000 square feet of living space and feature large, private backyard, providing the feeling of living in a single-family home. These unique townhomes boast many top-of-the-line features and high-end finishes throughout. Features commonly found in Trieste townhomes for sale include split-bedroom floor plans, upgraded hardwood and Saturnia marble flooring, vaulted ceilings, gourmet kitchens with granite countertops and stainless steel appliances, luxurious master suites with walk-in closets and luxurious marble baths, hurricane impact windows, and two-car garages. Some of the townhomes for sale at Trieste Boca Raton also feature additional bonus rooms, private elevators, and full outdoor kitchens. Residents of Trieste enjoy the community's on-site amenities as well as the exceptional East Boca location. Trieste offers a 24-hour controlled-access guard gate, a large resort-style swimming pool, as well as scenic biking and jogging paths that wind throughout the community. Trieste is also a pet-friendly community, with designated pet play areas and plenty of space for residents to walk their four-legged friends. Trieste is located right off Federal Highway in the heart of East Boca Raton, FL. The community is conveniently close many of the area's best shopping, dining, and entertainment options, as well as many nearby recreational destinations. Trieste Boca Raton is close to Spanish River Park, Gumbo Limbo Nature Center, Lake Wyman Park, and is just a short distance from the beautiful Boca beaches. Downtown Delray Beach is just to the north of the community, and I-95 and Florida's Turnpike are just a few miles away making travel to the surrounding cities a breeze. 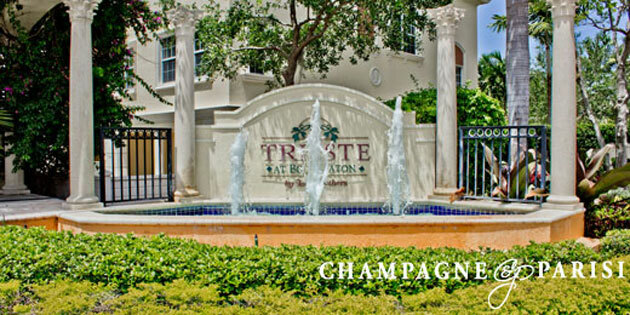 Trieste Boca Raton truly offers the best in South Florida townhome living. If Trieste Boca Raton sounds like the perfect community to suit your needs and desired lifestyle, you may also want to visit Library Commons and Vistazo, both of which also offer luxurious townhome living in Boca Raton, FL. If you would like to learn more about Trieste townhomes for sale or would like more information about any of the other townhome communities in Boca Raton, please call us at 561-998-9015. You may also reach us by completing the brief online form provided below and one of our Boca Raton residential real estate experts will be in touch to assist you. We at Champagne & Parisi Real Estate are committed to providing an exceptional experience when assisting each of our clients with their unique real estate needs and look forward to having the opportunity to assist you in finding your next Boca Raton dream home!